As we pride ourselves on monodispersity, our flagship product SUPSIL™ PREMIUM reflects a Polydispersity Index (PDI) of <0.025. 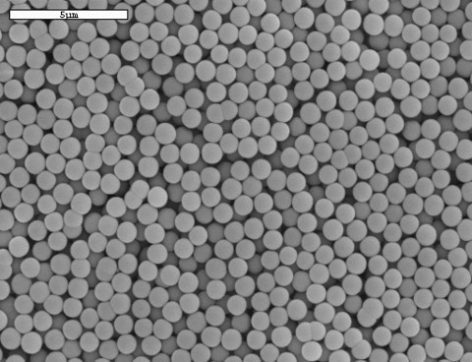 Our particle sizes range from 50nm to 3 microns with specific size targeting available within this range. Changes will arise in the coefficient of variation (CV) with 50nm particles to 1 micron particles showing a CV that is < 7%. Slight increases are seen in CV measurements with sizes between 1 to 2 microns showing a CV < 9 - 12%. 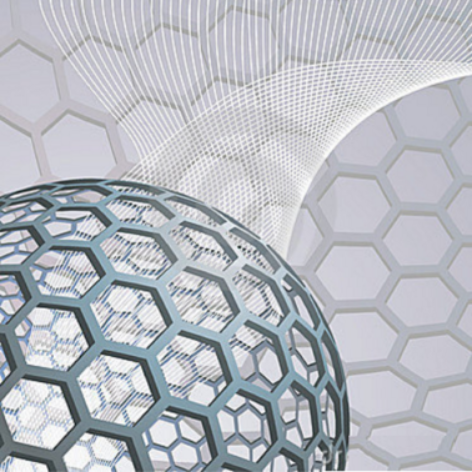 With a purity of 99.99% our SUPSIL™ PREMIUM can fit a wide range of applications. With applications where monodispersity and purity are of less concern, this affordable option will suit your needs. 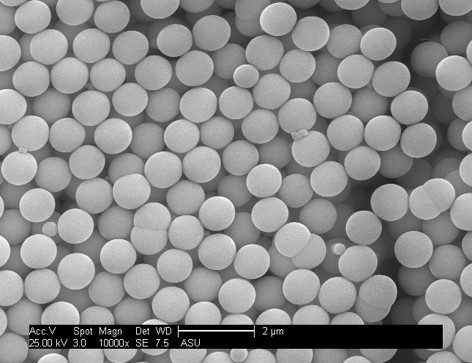 As with our SUPSIL™ PREMIUM product, our size of particles for SUPSIL™ STANDARD range from 50nm to 3 microns. The difference seen between these two products will reflect in the purity (99%), coefficient of variation (< 15 - 20%), and Polydispersity Index (PDI <0.1). For applications where monodispersity is not needed, we offer our highly affordable DISPOLY product. As seen in the image to the right, this product can come with two or more particle sizes and will therefore be sold in a range with varying sizes rather than a specific target seen with our SUPSIL ™ PREMIUM line. 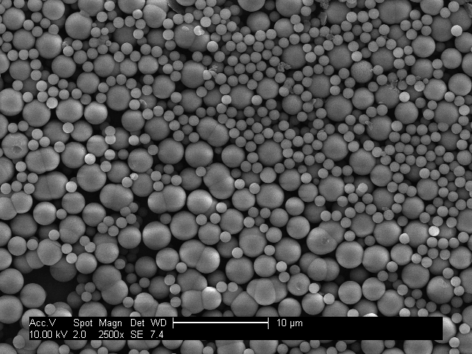 Our proprietary, patent-pending process has led to large scale production of monodisperse, superhydrophobic silica nanoparticles and microspheres. We retain our ability to target any size between 100 nm to 2 µm while producing large quantities. 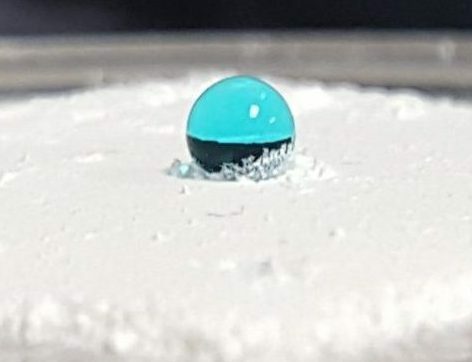 The particles are halogen-free and containing no harmful fluorinating agents that are traditionally used to fabricate superhydrophobic surfaces. Our superhydrophobic silica has a guaranteed contact angle of greater than 120 degrees with water. We also provide custom silane treatments. Please contact us directly for any custom treatments that you would require.